Solomon Elimimian is carving out quite a CFL niche for himself. The seven-year linebacker is the only player in league history to win three different major awards, and in 2014 he became the first — and only — pure defensive performer to be named the CFL's outstanding player. But for Elimimian, the greatest sign of success is championships and for the next two years he'll help the B.C. Lions pursue a Grey Cup title. Elimimian, 30, agreed Wednesday to a contract extension that will keep him with B.C. through the 2018 season. "When you're young you don't realize how significant Grey Cups are and how hard they are to win," Elimimian said. "I was fortunate to win one (in 2011) in my second year and it was the greatest accomplishment I've ever had because as a team you set out to do one thing and you don't want to let your brothers down. "But you realize how hard it is, we haven't been back since. It's about guys understanding that when you have an opportunity you've got to take hold of it because tomorrow isn't promised and the worst thing you ever want to say is, 'I could've,' because that will haunt you." The six-foot, 227-pound Elimimian immediately made a name for himself in the CFL, earning the league's top rookie award in 2010. He made league history four years later with the MOP honour — along with being named outstanding defensive player after recording a record 143 tackles. But the three-time CFL all-star said the 2016 season was his most satisfying. Elimimian posted a league-best 129 tackles, eight sacks, one interception and one forced fumble to earn his second top defensive player honour coming off a career-threatening Achilles injury in 2015. "I think so just because of how hard it was for me to come back," he said. "I grew so much as a person because adversity has a funny way of making you step outside your comfort zone and make a decision and commit to it. "I think last year was one that transcended football and my accomplishments because when I look back 20, 30 years from now, this will be something I went through and overcame that helped me grow as a person." Elimimian was scheduled to become a free agent in February but said he wanted to remain with the Lions. "This is where I want to finish my career," he said. "I've got great teammates, a great coaching staff that believes in you so for me this is the ideal situation." B.C. (12-6) posted the CFL's second-best record this season behind West Division-leading Calgary (15-2-1) in head coach/GM Wally Buono's return to the sidelines. The Lions edged Winnipeg 32-31 in the conference semifinal before dropping a 42-15 decision to the Stampeders in the Western final. But Elimimian said having the chance to continue playing for Buono also figured in his decision to remain. "In my opinion he's the best coach I've ever had," Elimimian said. "Wally is like a father figure to many guys . . . and has a way of getting guys to buy in and understand that life and football are intertwined. "He's somebody who's believed in me since my rookie year and given me an opportunity when maybe many people wouldn't have. He's someone who's able to motivate not just myself but many guys on the team, that's his gift." 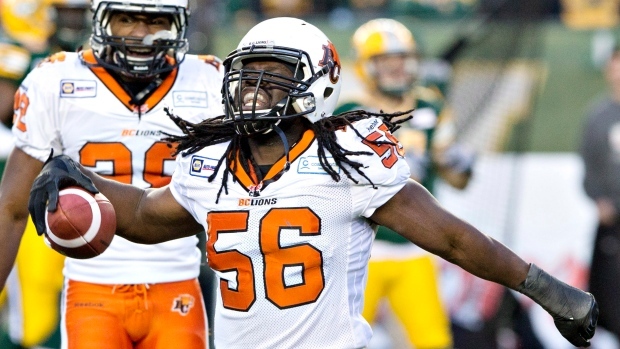 Elimimian has spent his entire CFL career with B.C., having registered 575 tackles, 27 sacks, eight interceptions and eight forced fumbles in 96 games. He needs just 13 tackles to break Dante Marsh's club mark. And Elimimian's return is good news considering the Lions recently released linebacker Adam Bighill so he could pursue NFL offers. "Guys like (Elimimian), the thing you're impressed with is how hard they work in practice," Buono said. "And when your best players practise hard, when your best players prepare hard, it sets an example for the young guys. "Once they're on board with you, then all things are possible." However, Elimimian isn't resting on his laurels. "I'm still that kid who was told he'd never play professional sports," he said. "I'm still that kid who never got drafted and was told he wasn't big or fast enough. "We talk about legacy all the time in the locker-room and you do it by winning Grey Cups. That's what I want for myself and my teammates."